The Sydney Internship and Study Abroad Program (SISAP) is the only program at W&L that provides students with both a study abroad experience and up to two internship opportunities during the same semester. In fact, students enrolled in this program are required to complete at least one internship (either in the U.S. or in Sydney). This program is also unique because students attend the University of Sydney as opposed to taking classes from a study abroad provider. While housed in off-campus apartments, students take a full course load and experience all the benefits and extracurricular activities offered by a top tier university. Students can work with W&L’s Office of Career and Professional Development to find 6-8 week domestic internships before leaving for Sydney in late February. Those completing this program earlier this year interned with a variety of firms including the Big Four accounting firms (Deloitte, EY, KMPG and PwC) non-profits, start-ups, real estate investment trusts and corporate advisory firms. Amanda Whalen ’18 and Caroline Holliday ’18 completed both domestic and international internships. For her U.S. internship, Amanda worked for EY in Columbus, Ohio, where she was trusted with substantial and varied work. She was given opportunities that helped to determine whether she truly wanted to pursue public accounting. “The U.S. internship gave me valuable work experience and skills,” said Amanda. “It was great to be able to intern during the busy season to get a better feel for the work I will be doing. I got to see what the environment was like under high-stress situations.” In Sydney, she completed a second internship in the internal audit department at Scentre Group. During the program, students wrote blogs about their individual experiences. 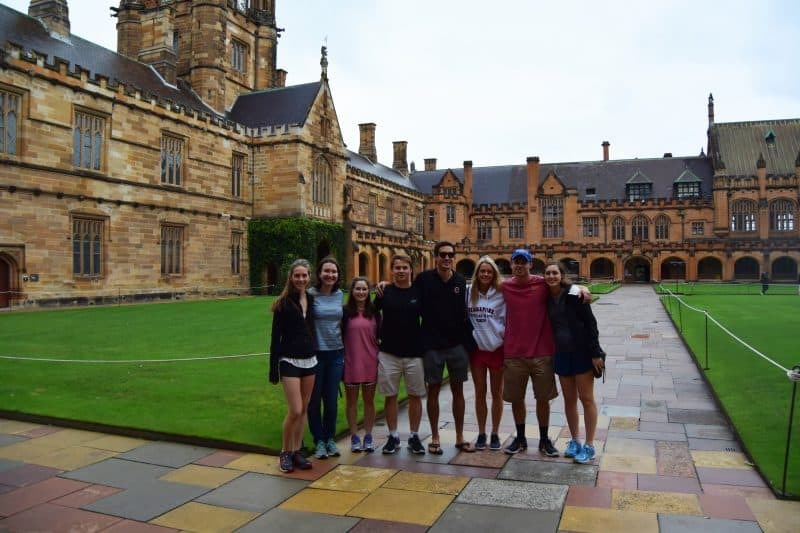 In addition to highlighting their Australian adventures, these posts provide a first-hand experience of what it is like to study at the University of Sydney, complete an international internship and more. You can read those blog posts here. The SISAP program is open to juniors majoring in accounting, business administration, economics and public accounting. A minimum GPA of 3.3 is required at the time of application. Those interested in the 2018 program should access Job ID #6254 through LexLink. The application deadline is Friday, September 29. The program coordinator, Professor Afshad Irani, will be available to answer questions at the upcoming Study Abroad Fair on Thursday, September 21 from 11 a.m. to 3 p.m. in Leyburn Library. There will also be an information session that day from 7 p.m. to 8 p.m. in Huntley 235, where Professor Irani along with SISAP alums and representatives from our third-party vendor will be present.